Definition: A connected digraph $D$ is Hamiltonian if $D$ contains a cycle that itself contains all of the vertices in D. This cycle is known as a Hamiltonian Cycle. There clearly exists a Hamiltonian cycle, namely the cycle $abcda$. 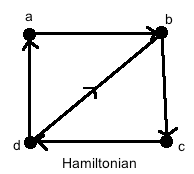 Once again, we should note that just because an underlying graph of $D$ is Hamiltonian, this does not necessarily mean all digraphs with that underlying graph are also Hamiltonian. However, if the underlying graph is NOT Hamiltonian, then any digraph with this underlying graph cannot be Hamiltonian as well. Hence, the orientation of the arcs is vital if we have a Hamiltonian underlying graph.